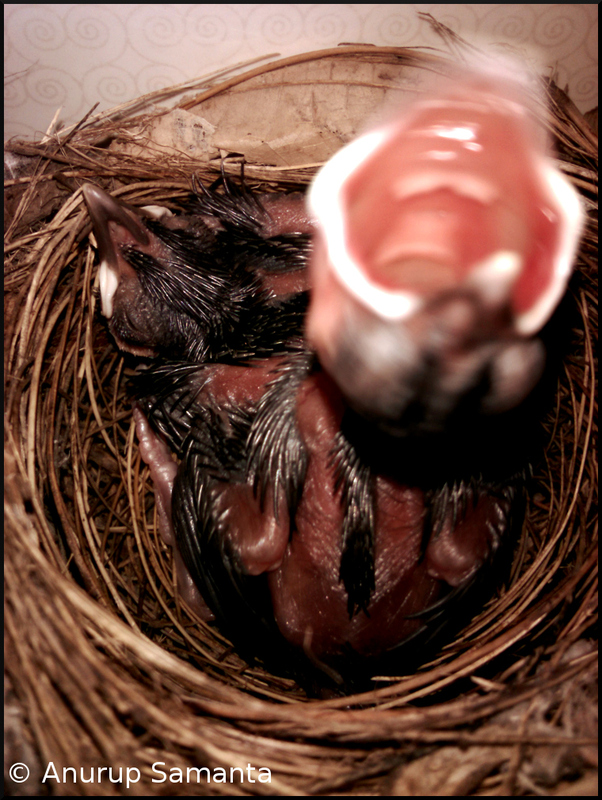 The blurred portion of the above photograph is nothing but the open mouth of one of those highly dynamic Bulbul nestlings, whose gentle tweets of late, act as the soul freshener for my otherwise dull washroom. Repeating the one-liner background info exactly 'N'th time for my new visitors: It has been a while since my washroom has been converted to a makeshift bulbul maternity ward and this is the fifth photo story of the bathroom saga (Click to read the First, Second, Third or Fourth photo post of this bulbul series)! The modest phone camera struggled in indoor lighting conditions to freeze fast moving beaks of the chirping nestling. 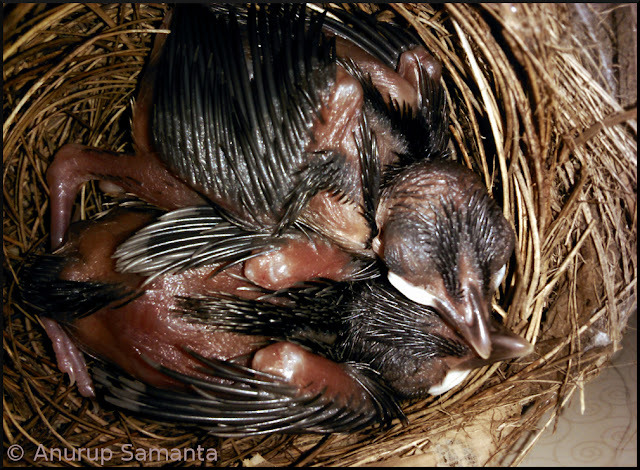 The physical development of two of these bulbul chicks have been pretty fast and satisfactory. Only gloomy note in this story is the disappearance of the third egg from the nest. Perhaps it got spoiled by itself. Who knows it might be a normal occurrence in a bulbul's clutch, as a population control measure by nature herself. Apart from chirruping in unison, the bonding in between these bulbul siblings is clearly evident from the harmonious way they move about and sleep inside the nest. The bulbul mother still keeps a watchful gaze over her chicks while catering to their needs and guarding the nest almost 24/7. It is quite addictive to monitor the development of these chicks every morning. Hopefully I'll be able to click few more shots of these nestlings before they finally bid goodbye to my washroom.